Healthy consumption of cannabis starts with organic growing practices. The I-Team uncovered a story about a patient who used a vape cartridge regularly and noticed his feet and hands going numb, as well as problems with his balance, vision and hearing. After doctors had no answers, he suspected the cannabis, and sent a cartridge of oil to Steep Hill Labs to get tested. Five different pesticides were discovered in the vape pen – including the disgusting myclobutanil (found in Eagle 20 pesticide). Myclobutani transforms into hydrogen cyanide — a known poison for centuries which can cause extreme damage to the kidneys, liver, and other organs — when heated. The chemist at Steephill reported that more than half of all cannabis related products (flowers, oils, tinctures, edibles and topicals) which they have tested recently have myclobutanil in them. Now the eager I-Team was ready to send in their troops. Undercover reporters, wearing hidden cameras, visited 15 dispensaries in four counties. They purchased 44 various cannabis products and were consistently told “absolutely no pesticides, none at all.” From the shaky perspective of the camera, I could see the budtenders (faces made fuzzy for anonymity) who simply gave the company line that it was all clean. I doubt they know any more than they are told, so no blame there. Yet, when NBC took the 44 samples to Steephill Labs, the results were staggering: 41 out of 44 tested positive for one or more of 16 harmful pesticides. That is horrendous and these items certainly should not be sold as medicine, or sold at all, for that matter. Curiously, California, one of the most regulated places on the planet, has not approved any pesticides for use use on cannabis and as yet there are no regulations. Presumably, that means no pesticides are allowed, none! Yet some growers take it to mean they can use anything. Pesticides were considered a miracle for generations and many enjoyed an increase in crop yield. Pesticides and plastic! Canned peas and styrofoam! These were all bad ideas which seemed fantastic at first. The outcome of the NBC news report was a stern warning to be wary of what you are buying out there at dispensaries. It could be poison. This story is sure to shake people up — it did for me. At first, it left me wondering how I can still be around today. I have been a cannabis aficionado since 1969, and I must have smoked more than my share of nasty pesticides back in the day. Then I thought of all the chemicals I must have inhaled as a judge in The Emerald Cup over the past 13 years. Testing for pesticides has only recently begun. Finally, I thought of all the unfortunate people who have experienced uncomfortable or harmful effects from ingesting contaminated cannabis. People think they are enjoying something pure, especially when smoking well-cured green flowers, but if they are grown without respect and organic methods they will never have the same effects, both medicinally and psychotropically. When people from outside our tiny cannabis grower’s world in the Emerald Triangle imbibe some of the local craft cannabis product, they are blown away by how flavorful, potent and smooth the smoke is. I used to think it was because they were here in these stunning hills of Mendocino, breathing fresh mountain air. Now I have a new theory. They are smoking — often for the first time — pure cannabis that has been grown outside under the sun, with pure water and lots of love and no pesticides. What a difference it makes. They report not feeling nervous like they usually do when they smoke cannabis. Instead, they relax, laugh a lot and feel great the next morning. That’s how it’s supposed to work. It’s not easy to grow with organic, living soil methods, and the plants may indeed be a little smaller than a pumped fertilizer fed, pesticide sprayed monster. But the flowers will be sweet and clean and their terpenes will be pungent. Given the proper love and tender care, these delicate ladies will flourish without the need of any deadly chemical pesticides. Of course, I speak mostly about cannabis flowers as that is my specialty. I know they crave natural sunlight and fresh air. No pesticides allowed! It is interesting that the NBC story happened in Southern California, a mecca of organic health food stores, gyms, clubs and spas. In California people are just learning the benefits of clean cannabis as the market comes out of the shadows and into the light. Before there was medical legalization, buying “pot” was a crapshoot, people often got burned, but now there is choice. Patients truly looking for healthy medicine, or someone simply looking for a good high, will soon learn the benefits of The Pure. I am truly sorry for this guy on the news who became so ill, and for all the others out there who have suffered. Clearly, this is a lesson for all of us. 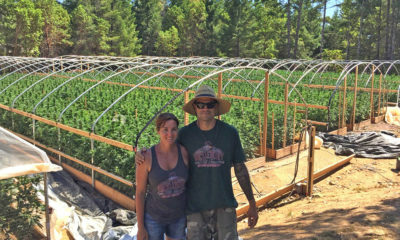 If you’re the type of person who cares about your body, mind and spirit – enough to pay extra for organic food – then now is the time to switch to sungrown cannabis, cultivated with “organic methods.” In the Emerald Triangle craft cannabis farmers are leading the way to pure cannabis, incorporating regenerative agriculture techniques to recreate the living soil food web, using resources from the land itself without chemicals and pesticides. So choose your cannabis and your dispensary wisely. And if you eat organic food, you should consume sungrown organic cannabis. May your highs be healthy! TELL US, are you concerned about pesticides in your cannabis? Great article. I’ve felt for some time that rank commercial cannabis grows need to be extremely carefully regulated and inspected to avoid introducing yield enhancing chemicals the same way most of our agriculture does. Organic (USDA-regulated) has been the only way out for food, and a certification similar to that and labs to back it up are required for cannabis. If you think about it for a moment, extremely high-value crops grown under artificial circumstances are ripe for abuse. Everything is pumped and plumped with boosters to get the maximum yield. So of course they use an array of pesticides to reduce crop damage and maintain marketability. Whatever kind of weed comes out of those grows, it isn’t natural and it surely isn’t pure. And likely it’s not healthy at all. Thankfully, if you work at it (at least in WA state — can’t speak for CA), you can find growers who keep it clean. They aren’t the cheapest and they often have less strains available, and their buds don’t look as nice and might not be as potent, but they won’t ruin your health. Also, moderate-temp vaping gives you a chance to survive the pesticides that might be in some of your weed. In contrast, inhaling the smoke from burning pesticides is the worst-case scenario.